If you need to purchase a subscription. Artist Tamar Fishman and her husband, Sam, center by their four sons are all smles at the 254-year-old Touro Synagogue in Newport, Rhode Island, where the ceremony issuing the Chanukah stamp was held. This year’s Chanukah stamp is a paper-cut image of a nine-branched chanukiah placed in the subtle outline of a jug. The background is enlivened by flowing vines and flowers. “The image was inspired by the first drawing of a menorah found in a cave,” explained Tamar Fishman, the stamp’s designer. Creating the art for this year’s Chanukah stamp began nearly two years ago at a drafting table in Fishman’s Bethesda, Maryland, home. The U.S. Postal Service (USPS) gave her the freedom to create her own piece. She said she “played” with different iconic Chanukah symbols and made dozens and dozens of pencil sketches that included the chanukiah, the dreidel and ancient oil jugs, recalling the tale of the jug of oil in the ancient temple that lasted for eight days. “I did so many versions … some went this way, some that way,” she said, indicating horizontal and vertical. Once a final sketch was approved, Fishman drew the piece on a poster-sized tag board and began the intricate process of cutting out the paper, which takes a steady hand, an eagle eye and intense concentration. After Fishman and USPS stamp designer Ethel Kessler selected the background colors, a photographer shot the piece in order to print it. One of the hardest parts of the project? Keeping it a secret until the final design was announced this past summer. Traditional Jewish paper cutting was popular in the Jewish shtetls, especially in Poland in the 19th century. Fishman has raised the bar of this folk art with her eye for detail and her focus on contemporizing Jewish ideas, themes and forms. For more than 30 years she has designed and cut using a collection of finely pointed and steadily held artist’s knives. Her work, mostly commissions, adorns synagogues and homes, but also art galleries and government buildings. 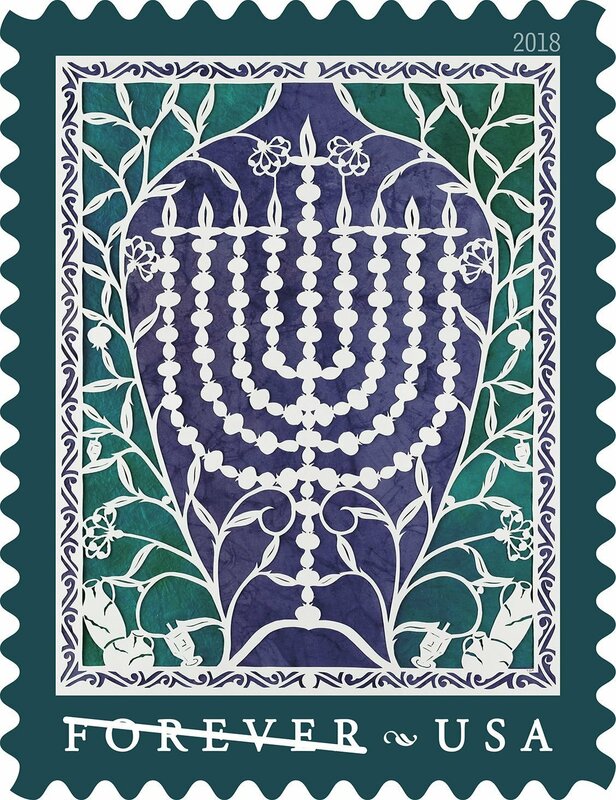 While the USPS has put out traditional Christmas stamps for more than 50 years, it issued its first Chanukah stamp in 1996. To mark that occasion, USPS partnered with Israel’s postal service, Israel Post, for a joint issue. This year, both countries again collaborated in issuing the same Chanukah stamp — the differences are in the currency and the name of the country. Israel Post stated that the dual-nation Chanukah stamp marks 70 years of U.S.-Israel diplomatic relations. For Fishman, the eight-and-a-half shekel stamp and the U.S. Forever stamp carrying her artwork are particularly meaningful as she herself is a dual citizen. But this isn’t the first time the United States government has commissioned the Israeli-born artist to create a one-of-a-kind original. In 1981, the U.S. State Department contacted Fishman to design and cut a work that would serve as a gift from President Ronald Reagan to Israeli Prime Minister Menachem Begin. It hung in Begin’s office while he was prime minister. Fishman came to paper cutting by accident. In college in Jerusalem, she studied botany but before she finished she married a young American rabbi, Sam Fishman, and moved with him to the United States. She completed her master’s degree in botany at the University of California, Los Angeles while her husband was the campus rabbi there. Soon, the couple resettled in the Washington, D.C., area and had four boys. Fishman recalled that for her oldest son’s bar mitzvah, which fell at Chanukah, she decorated the synagogue with cutout designs backed by colored cellophane. She spent months researching Judaic art —– including chanukiot — in the encyclopedia and painstakingly cutting out her designs. The commissions have come in for decades and Fishman is the region’s go-to artist for customized, original ketubot — Jewish marriage contracts — that are works of art. Though she doesn’t know how many ketubot she has designed and cut over the past 30-plus years, it must be hundreds. And now, she’s receiving second-generation requests, as children of her early customers are beginning to contact her. On Oct. 16, Fishman, her husband and their four sons traveled to Newport, Rhode Island, where the 2018 Chanukah stamp — with her original artwork — was issued in a ceremony that included Israel Post’s Philatelic Service Director Elhanan Shapira. The event, held at the country’s oldest synagogue, the 254-year-old Touro Synagogue, was a high mark in Fishman’s singular career as a creative Jewish artist. Is deferred compensation for you?